Liverpool have developed a simple craving. Their yearning for a trophy, any trophy, this season is palpable both in the way they play and the way they celebrated reaching the last eight of the FA Cup. As the club’s players hugged each other and rejoiced with fans after coming from behind to win at Selhurst Park, Brendan Rodgers explained the importance of winning silverware this season. “The players are young and hungry and this is a group that can grow over the next couple of years but we would like to get a trophy to signify that growth,” he said. It is no doubt true that landing a trophy would increase Liverpool’s players’ confidence in their ability to see campaigns through to a triumphant conclusion. And victory can be self-perpetuating. 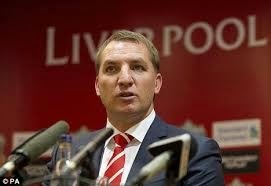 What Rodgers did not say is that Liverpool also need a trophy to help increase belief in him. The Northern Irishman has won plaudits for the style he has fostered in his two and a half years at Anfield but knows he needs to start winning prizes to prove to the club’s supporters, and his employers, that he is a manager of substance. He has no wish to become known as someone with highfalutin ideals but a lack of respect for realpolitik – or, as José Mourinho might put it, a specialist in failure. So Rodgers fielded his strongest available team at Crystal Palace as he sought to advance in a competition from which Mourinho’s team and Manchester City have already been ousted. He will deploy a powerful side again on Thursday as Liverpool host Besiktas in the last 32 of the Europa League three days before they travel to Southampton for a match that could have a big impact on both sides’ bids to qualify for next season’s Champions League. After that will come the away leg at Besiktas and a home match with Manchester City, by which time Liverpool will have played as many games this term as they did in all of last season – and they would still have a quarter of their league campaign left and up to 10 more matches in the other two tournaments. Rodgers, then, must ensure that his team’s eagerness to win a trophy does not backfire. He believes that challenging on all fronts strengthens rather than weakens his team’s chances on each.